With the recent release of Intel’s new 22nm Ivy Bridge CPUs, boutique computer manufactures such as Alienware, Digital Storm, Maingear and many others have updated to the new silicon and plunged in on to the opportunity to be the best on the block. As an update to the Sandy Bridge processors, the new Ivy Bridge processors boast lower power consumption, a die shrink, and higher performance. The update will affect both laptops and desktops ranging from thin and light 11″ notebooks to high end gaming desktops. Interested in what the companies have to say about their updated products? More details in the following pages. Fremont, Calif. – (April 29, 2012) – Digital Storm, the predominant name in computer system integration and engineering, is proud to announce integration of Intel’s new 3rd generation Core processors into its entire line of gaming PCs and laptops. Now Digital Storm customers can harness the power of the world’s most advanced processor in their dream machine. Digital Storm systems featuring Intel’s new 3rd generation Core processors offer gamers and enthusiasts a distinct advantage thanks to the CPUs unique architecture. With the addition of 3D Tri-Gate transistors and a 22nm process, Digital Storm systems will generate less heat and deliver higher performance compared to Sandy Bridge CPUs. I told you something was coming. It’s that time of year again, folks! North of the Tropic of Cancer the birds are building their nests, the flowers are blooming, and everywhere signs are appearing that nature is freshening up for summer. In keeping with the season, Alienware is “freshening up” its line of gaming laptops just in time for summer! Some of you may have noticed recently some changes to our gaming notebooks recently on Dell.com. We know our friends at The Verge did, so I’m here to tell you exactly what’s coming with the new Alienware M14x, Alienware M17x, and Alienware M18x laptops. At a glance, the M14x is the same attractive dimensions, weight, and design as before, but when you lift the hood you’ll find little that hasn’t been spruced up. At its core lies the new Intel HM77 Chipset – this not only includes the blazing fast USB 3.0, but is also fully forward compatible with future “Ivy Bridge” processors and up to 16GB of 1600MHz RAM. This chipset also enables PCI 3.0 for enhanced NVIDIA GeForce 6-series graphics, meaning your games benefit from amped up GRRD5 graphics in a 14-inch form factor. Another new graphics option included in the new M14x is WirelessHD – allowing you to untether your graphics performance for even more freedom. The first series of M14x laptops allowed dual hard drives, but at the expense of an optical drive. With this refresh, I’m happy to report this is no longer the case: not only can you configure your new Alienware M14x with dual solid-state drives in RAID 0 or RAID 1, but you can do it without sacrificing your optical drive option. Also with the refresh comes the highly-anticipated Blu-Ray drive option for the M14x! Even the sound system in the M14x got a boost! The new line of Alienware laptops all include the Creative Sound Blaster Recon3Di High-Definition 5.1 Audio as the standard option, and included in the mix is THX TruStudio Pro Software, 2.1 surround with a subwoofer, 7.1 Digital Audio out using HDMI or S/PDIF optical port, in-line mic support, and of course audio powered by Klipsch. Never have any Alienware laptops sounded like this! Not to be outdone by their little brother, both the Alienware M17x and the M18x benefit from the Intel HM77 Chipset upgrade, giving all three Alienware laptops are forward compatibility with “Ivy Bridge” 22nm processor technologies, and all three get a boost to graphics performance. Our M17x system is the first gaming laptop on the market to offer the blistering 2GB GDDR5 AMD Radeon 7970M, and both the M17x and M18 offer up to 32GB of 1600MHz DDR3 RAM, giving you plenty of heft to lift those heavy gaming loads. With the M18x, you even have the option of getting 3 solid state drives in RAID 0, something never before seen in an Alienware laptop. 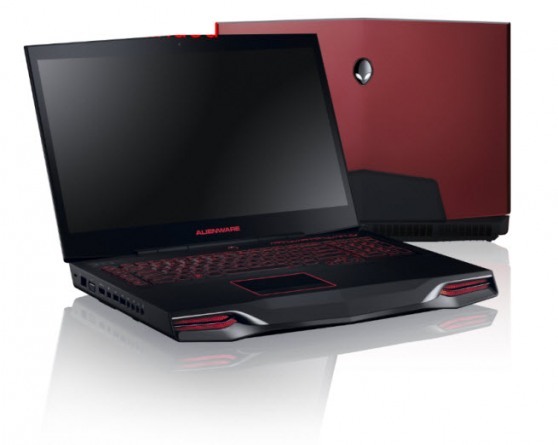 The larger laptops also include the upgraded audio package, and all three laptops include Alienadrenaline software to configure your games to quick-launch associated programs, giving you the power to completely customize you gaming experience. You may remember AlienAdrenaline from the X51 Launch post earlier this year. The feature is so popular on the X51 that it’s now making its first appearance on our line of gaming laptops. While there’s a lot to be excited about with these new laptops, I’ve saved the best for last. Those who’ve ordered one of these three updated laptops and whose orders haven’t shipped yet, we’ll be upgrading your processors from second generation Intel Sandy Bridge processors to a comparably-priced third generation Ivy Bridge processor automatically! Prices start at $1099 for the M14x, $1499 for the M17x, and $1999 for the M18x. These systems are available now on Dell.com and Alienware.com. Click here to see more images of all three laptops on Dell’s Google+ page. Feel free to let us know what you think. What I really want to know is when will you get yours? MAINGEAR offers new updated 3nd generation Intel® Core™ processor Extreme Edition with the new addition of the redesigned F131 chassis and the all new Potenza desktop featuring MAINGEAR’s venerated VRTX (Vertical Exhaust) Cooling Technology. Kenilworth, New Jersey – April 29, 2012 – MAINGEAR, a PC innovator and award-winning PC system builder offering custom desktops, notebooks, and workstations introduces 2 new desktops with vertical heat dissipation chassis design (VRTX Cooling Technology) and updates all desktops and notebooks with the new 3rd generation Intel Core processors. The MAINGEAR SHIFT was the first in the industry to offer a custom PC that rotates the internal components of the PC to leverage the natural tendency of hot air to rise. As it exhausts through the top vents, cool air is drawn in from the bottom of the chassis, keeping components cooler, limiting noise, and increasing overclocking and stability potential. This vertical heat dissipation design has won MAINGEAR a 2011 CES Design and Innovations award as well as numerous editors’ choice awards. 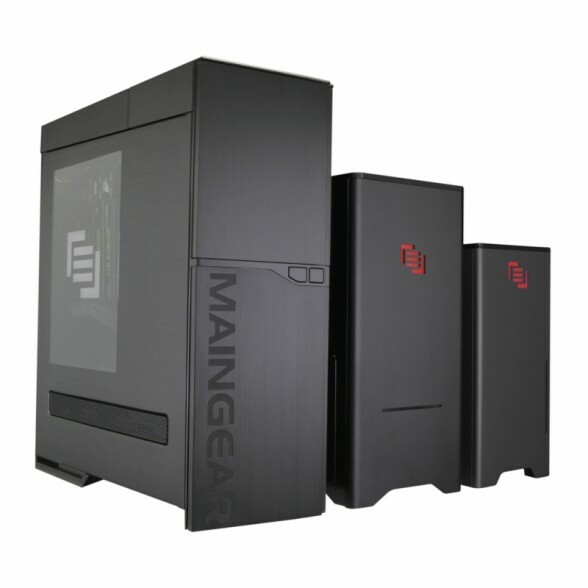 MAINGEAR is proud to offer two more desktops to create a family of desktops that offer vertical heat dissipation design with different chassis and performance selection grades. The well-known and award-winning MAINGEAR F131 has always offered a more traditional yet powerful mid-size tower solution for those looking for something smaller than the SHIFT with extreme performance at a lower price point. The new MAINGEAR F131 chassis will now offer a new micro ATX vertical heat dissipation design that is similar to the SHIFT, delivering on customer demand for VRTX Cooling Technology in a smaller footprint without compromise. The new F131 will support the latest technology, offer dual GPUs of any length, and includes a hot-swap, tool-less bay for quick data storage needs. In addition, options to select MANGEAR EPIC innovations such as the EPIC 120 CPU cooling as well as the EPIC T1000 will also improve the overall high performance PC experience. The F131 features a bold and clean 360 degree exterior design with a slot loading optical drive and the same refined aesthetics as its older brother, the SHIFT. With a 2.5mm thick, sand-blasted and anodized aluminum chassis and its 9.25″(W) x 19.17″(H) x 11.18″(D) smaller size, this system takes up 38% less space than the previous F131 design without compromising on performance. The starting at price for the new F131 is $1,049. The 3rd desktop to offer vertical heat dissipation solution is the new MAINGEAR Potenza, the world’s first mini-ITX gaming solution designed for overclocking with a Digi+ VRM design found on larger, full-sized desktop motherboards. The Potenza offers a mini ITX custom desktop solution that is 45% smaller than the new F131, 76% smaller than the SHIFT, and offers an even smaller desktop solution with a smaller footprint design and no cables on four sides just like the new F131. The Potenza can accommodate graphic cards up to 10″ including the latest NVIDIA GeForce GTX 680, support one 3.5″ and two 2.5″ drives, includes a 140mm Air Penetrator fan and also supports the EPIC 120 CPU liquid cooling that can be installed to satisfy needs of any enthusiasts or office. With the petite size of 7.4″(W) x 15.6″(H ) x 9.25″(D), the MAINGEAR Potenza’s sleek design further increases the appeal of this unique computer form factor. The starting at price for the new MAINGEAR Potenza is $899. If the plain black box isn’t enough for you and more color is desired, exterior design can also be customized with different automotive quality paint options that are affordable or etched with name, artwork or logo. Combined with technology from MAINGEAR’s EPIC Research Labs like the EPIC Audio Engine, EPIC T1000 phase change thermal material, and EPIC CPU liquid cooling, MAINGEAR’s new custom desktop family rolls up to be one hell of a beast that runs silent, cool and powerful. Staying true to pushing performance, all of MAINGEAR’s desktops: MAINGEAR SHIFT, F131, Potenza, VYBE and X-Cube along with the Alt and eX-L series notebooks offers the latest and fastest in custom computer technology including the new 3rd generation Intel® Core™ processor with the option to overclocked for more even more performance. Whether it’s for serious multimedia or multitasking, PC enthusiasts can unlock a new level of PC experience with expert overclocks courtesy of MAINGEAR’s decade of performance innovation.